Athletics is a metaphor for life as sports sometimes teaches a lot of lessons. The lessons apply to competition but can also be applied to life itself. Those lessons include discipline, adversity, reward, honesty, responsibility, structure, team work, and sportsmanship. In the real world, parts of the state of Texas are going through the aftermath of Hurricane Harvey. On television, the Texas spirit of helping their neighbors and total strangers have been exhibited all throughout the affected areas. At the Marcus I Invitational this past weekend, that same Texas spirit and sportsmanship was on display at it's purest. 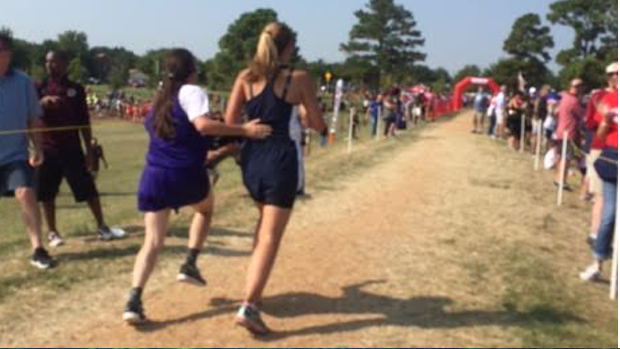 In the girls JV race, Sydnee Olive from Keller was running her first race in a big time meet like the Marcus I Invitational. The girls JV race was one of the later races and they temp was rising. Olive was clearly struggling, and was borderline walking, "I was dying out there, this is my first race, I didn't think I'd be able to finish." We have all been there, but what is an athlete to do when they are surviving a race? For Olive, a blessing came in the form of a young lady in a purple uniform. Not only was the blessing in a different uniform and from a different school, but it was from a complete stranger. Dallas Sunset runner Cadie Shaw was running her own race when she heard the crowd encouraging Olive who was running behind her. Shaw turned around and saw Olive walking and struggling to deal with the heat and fatigue. Unlike the 255 other runners in the race, Shaw decided to slow down and wait for Olive to catch up to her. Shaw made the decision to run with Olive for the remainder of the race even placing her hand on her back and pushing her to the finish. Who does that? Why would you decide to sacrifice your race to help a complete stranger....a competitor? "I like to run, I want to help people." Not thinking she'd make it Olive said, "It means a lot, because I probably wouldn't have finished. It's all about teamwork even when you're not on the same team." Dallas Sunset is a school in the Oak Cliff part of town and in Dallas ISD, as Keller is north of Fort Worth, so the two student-athletes were not familiar with each other at all. As Shaw said, "It's good to help people out, why leave someone behind." The two young ladies even had a good word for the people affected by Hurricane Harvey, "Don't give up and have each other's back like she had mine."